The latest generation of entrepreneurship has encouraged many niches and industries to break out of their traditional molds, and in doing so, many businesses and independent professionals are second guessing what makes the perfect office space. Statistics show that both productivity and the quality of work employees and self-employed professionals can offer is strongly influenced by their working space. After all, something as small as the wrong color scheme or a strange layout can lead to distractions, poor mood, and even headaches that hold work back. With this in mind, you, as a business or as an independent worker, may be considering which style of office is best for you – sharing with another or renting your own private space? To make your decision easy, here are the pros and cons of each, and which may work best for you. - Shared Pros A shared office – also known as a co-working space – is the more modern and upbeat approach to a working space, allowing entire businesses to share an office, individual employees to work in the same cubicle, or freelance workers to rent a space with another professional who may or may not have the same style of career. A co-working office space is, in essence, a roommate agreement, where both parties cover the rent and share the space equally. Because of this, it’s possible for you to find office spaces within your price range which are high quality for a high quality price. On the flipside, you can choose a more economical option and find even greater savings than before by splitting the lesser expense. With all the prices halved, your options are much broader than before. This advantage isn’t only available to businesses and literal co-workers; independent professionals looking for a base to work from can find collaboration, advice, and guidance on their projects from their stand-in co-worker with a shared office. A co-working space offers proximity to new minds with new perspectives, allowing employees to take on tasks together with greater efficiency, and offering the solo worker a chance to benefit from a second opinion in an entirely different field. This can offer your business an edge and make the working process even smoother than before. - Shared Cons Even with these advantages in mind, there are definitely some elements that can hold you back with a shared office. For some, working near another person is no issue, but for others, it’s as appealing as nails on a chalkboard. A shared office space does indeed limit your privacy, especially if you have a co-worker who likes to glance over at your computer whenever they’re on their lunch break. However, this con can be resolved easily if you’re very particular about the ‘roommate’ you choose to share with. Anyone who’s ever worked in an office knows the danger of distractions. It can be as simple as a loud copy machine or as detrimental as a co-worker who likes to take personal calls – on speaker – while you’re in the middle of an important project. A shared office does leave you more open to these dangers, but the solution is in the problem; your co-worker will likely fear the same level of distraction from you. By addressing these issue early and setting very clear ground-rules about what activities, noises, and habits should be allowed within the co-working space, you could eliminate these distractions before they begin. 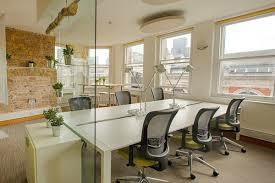 - Renting Pros Renting an office is the tried and true approach to a workspace. You make the decisions, you cover the entire cost, and you are ensured complete and total ownership over your workspace, without intervention from others. By renting a personal office space, you are earning yourself complete and total privacy. No one can enter without your permission, there will be no noisy co-workers glancing over your shoulder, and should you need to take a sensitive business call, there is no danger of being overheard. A private workspace offers you complete control over how the space is arranged, decorated, and maintained. If you prefer bright colors, various lights, and posters coating the walls in order to get into the ‘work’ mindset, then there’s no danger of a co-worker objecting. - Renting Cons However, renting a personal space isn’t all sunshine and roses. There are some very real disadvantages that make it clear why the modern generation is turning to a shared office space. The disadvantage of renting your own personal space is the need to cover the cost all by yourself. What you may have been able to afford with a roommate is now entirely off limits, because the price has essentially doubled without the second party. To add insult to injury, without a second person to shoulder the cost with, you’re also on your own in times of emergency. If hard times come and you’re unable to cover that month’s rent, the landlord will be looking directly at you – not at your co-worker, who may generously offer a loan. Lower Quality For Your Price Range. If you decide to look for an office that’s more within your price range, you will find your options limited in terms of quality; a co-working space allows you to get more for less, since you are only paying half. With the added privacy, you get what you pay for – meaning that if you were to choose something more affordable, you may find yourself in an low quality and cramped working space that saves money but offers few advantages When deciding on the best style of office for yourself or your employees, it’s important to consider the needs of your business, the working style of all parties, and how well each member collaborates and respects privacy. For privacy and complete control over your space, renting is the ideal option, but for the economical, the creative, and the collaborative, a shared office space is the best choice.